One of the country’s most notable civil rights developments occurred on July 26, 1948, when President Harry Truman signed an executive order ending racial segregation in the US Armed Forces. The order led to desegregation of the military, although it took the US Army six years to completely desegregate its units. 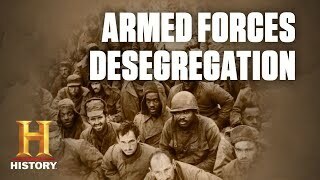 The Army’s last segregated units were finally integrated or disbanded in 1954. The order also established an advisory committee to examine the military’s practices. Previously, African Americans, Japanese Americans and other racial minorities in the United States were placed in separate units from white soldiers. Truman had good reason to issue the order, as the country got embroiled in the Cold War with the Soviet Union. With blacks threatening to boycott the segregated armed forces, the United States needed the full participation of African Americans and other minorities to retain the strength of its military. At the time, African Americans comprised about 10 percent of the total US population. Four years later, Congress passed the Immigration and Nationality Act of 1952, also known as the McCarran-Walter Act, which allowed Japanese and other Asian-born immigrants to become US citizens. The McCarran-Walter Act faced widespread opposition and a presidential veto before it took effect June 27, 1952, abolishing the “alien ineligible to citizenship” clause from US immigration law. After its passage, the Act disproportionately benefited Japan, which received the largest annual immigration quota of 185 per year, compared to 100 for other Asian nations. 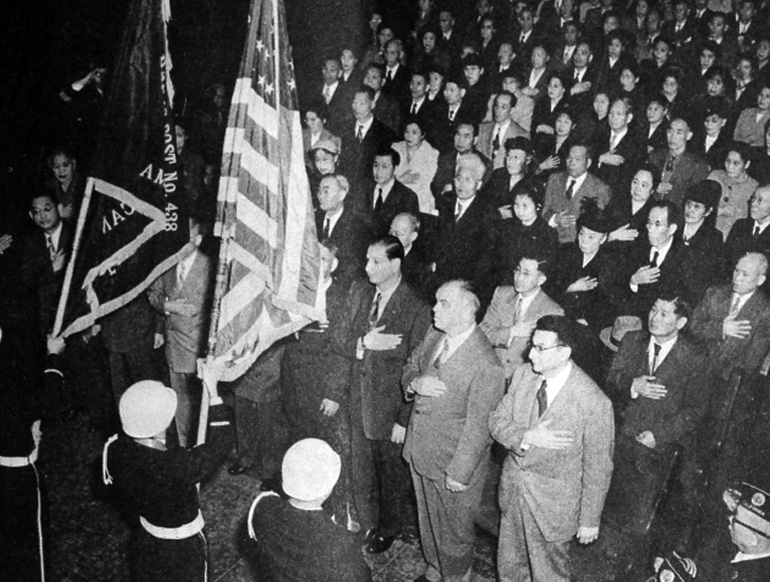 Between 1952 and 1965, more than 40,000 first-generation Japanese became US citizens. 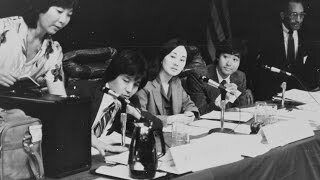 The Japanese American Citizens League (JACL) was instrumental in lobbying for the bill and was widely criticized by other civil rights organizations for backing it. Despite the act’s appearance as a step forward for civil rights, it originated as a way to contain communism by making it easier for the government to denaturalize those suspected of being national security threats. 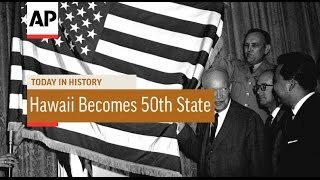 Hawaii became the 50th state in the United States in 1959, after decades of lobbying. President Dwight D. Eisenhower signed a proclamation admitting Hawaii into the Union on Aug. 21, 1959. Some 93% of Hawaii’s voters approved the proposition, with the hopes of electing their own governor, participating in national elections, receiving federal funding and having more influence in Washington. Hawaii had been a territory of the United States since 1898, after the overthrow of the Hawaiian monarchy, but it took nearly 60 years to achieve statehood amid reservations about the islands’ large non-white population. 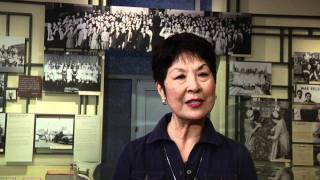 The heroics of Hawaii’s Americans of Japanese Ancestry (AJAs) during World War II definitely helped the cause, along with persistent and effective lobbying of Hawaii’s Democratic Party. 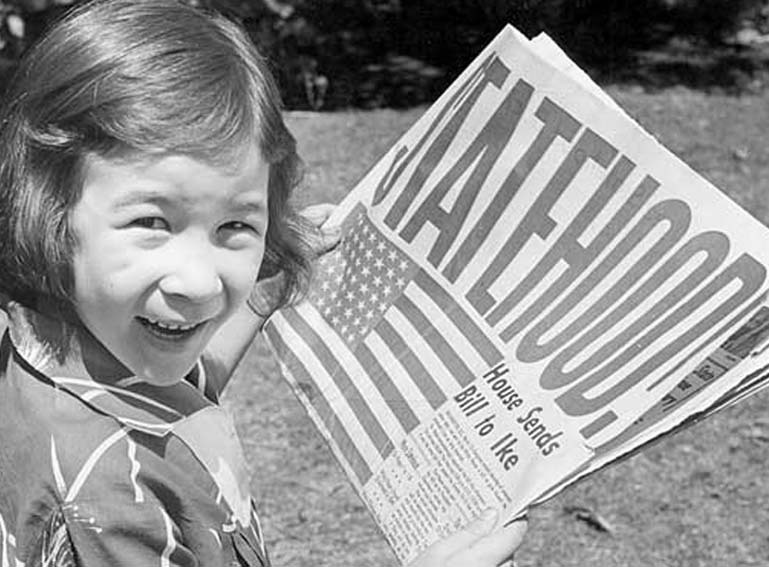 The push to statehood was spearheaded by John Burns and newly elected Japanese American politicians, such as Daniel Inouye. In 1956, Burns had been elected as Hawaii’s Democratic delegate in a Democrat-controlled Congress. In Washington, Burns garnered the support of Southern congressmen, who were the leading opponents to Hawaiian statehood. In 1961, Honolulu and Bruyères, France, established a sister-city relationship. 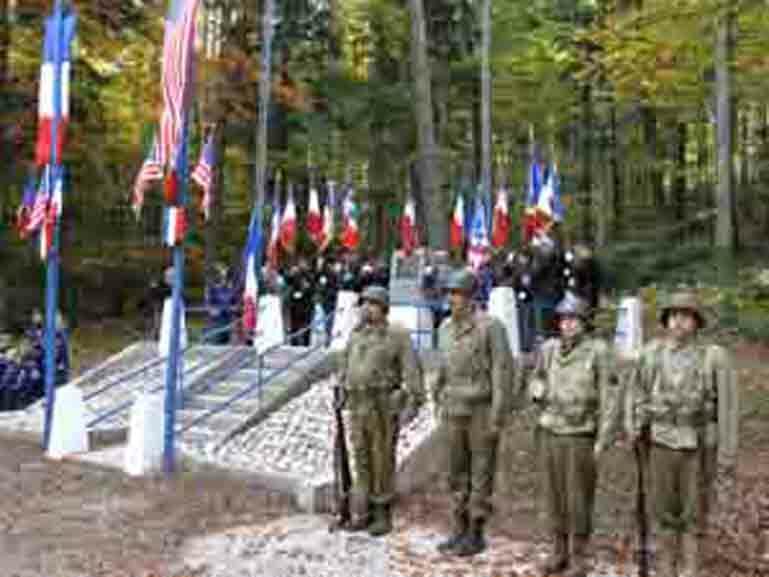 Bruyères had been liberated from Nazi occupation during World War II by soldiers from the 100th Infantry Battalion/442nd Regimental Combat Team. American cities, counties and states began developing sister relationships with international counterparts after World War II, as a way to generate friendships and cultural ties. Honolulu’s sister-city relationship with Bruyères was initiated after 442nd veteran and Honolulu resident Wilbert S. “Sandy” Holck visited Bruyères in the late 1950s, and befriended Gerard Deschaseaux, a Bruyèran who understood some English. The two men, both of whom took part in the brutal Battle for Bruyères, became close friends and collaborated to convince their respective city governments to form the Bruyères-Honolulu sister-city relationship. Honolulu commemorated the 50th anniversary of its sister-city relationship in 2011, with a ceremony honoring veterans from the 100th Infantry Battalion/442nd Regimental Combat Team as well as visitors from Bruyères. John Burns remains one of Hawaii’s most influential and beloved governors, credited with ushering in the state’s still-dominant Democratic party. He was elected as Hawaii’s second governor in 1962, amid wide AJA support. 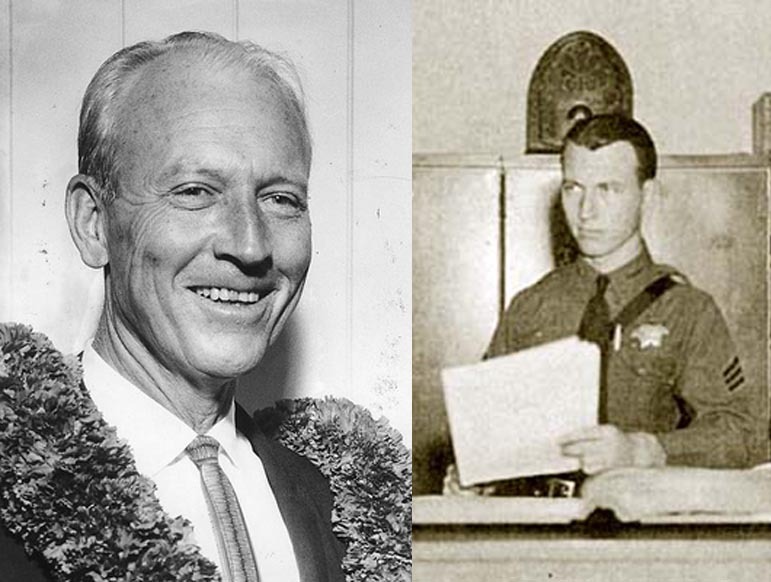 The former Honolulu police captain remained governor until 1974, backed by Nisei veterans and organized labor, who became key components of the Democratic Party. His ties to AJAs began in early 1941, when he became the head of the Honolulu Police Department's Espionage Bureau with a task of assessing the loyalty of Hawaii’s Japanese population. 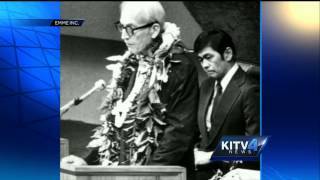 Burns’ outspoken support of AJAs after the attack on Pearl Harbor is credited with helping prevent mass internment of Hawaii’s Japanese Americans. His calls for equal treatment of AJAs also led to the formation of the 100th Infantry Battalion and 442nd Regimental Combat Team. He left the police force for the world of politics at the end of World War II, losing several races before he was elected a Democratic delegate to Congress in 1956. While in this role, as mentioned earlier, Burns was instrumental in Hawaii’s efforts to achieve statehood. Although he lost the1959 state gubernatorial election to Republican William Quinn, he won by an overwhelming margin three years later and was re‐elected easily in 1966 and 1970. As governor, Burns guided the islands through a dramatic period of growth and helped shape a political system based on equality and racial tolerance. 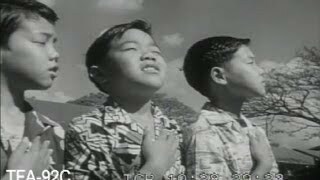 In 1954, he bolstered a ticket of candidates that included Daniel Inouye and Spark Matsunaga. Burns died of colon cancer on April 5, 1975, leaving a legacy as the Father of the Democratic Party. 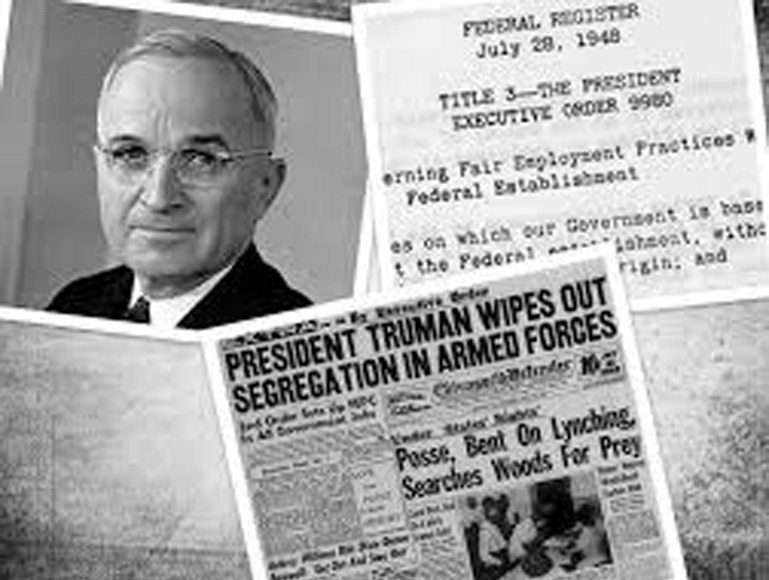 President Truman ordered desegregation of the US Armed Forces. It took the US Army six years to complete desegregation of its units. Provisions of McCarran-Walter Act allow naturalization of Japanese immigrants. Statehood Proclamation signed by President Eisenhower. Honolulu & Bruyères, France, establish sister city relationship. John Burns, former Honolulu police captain, elected governor with widespread support from AJAs.